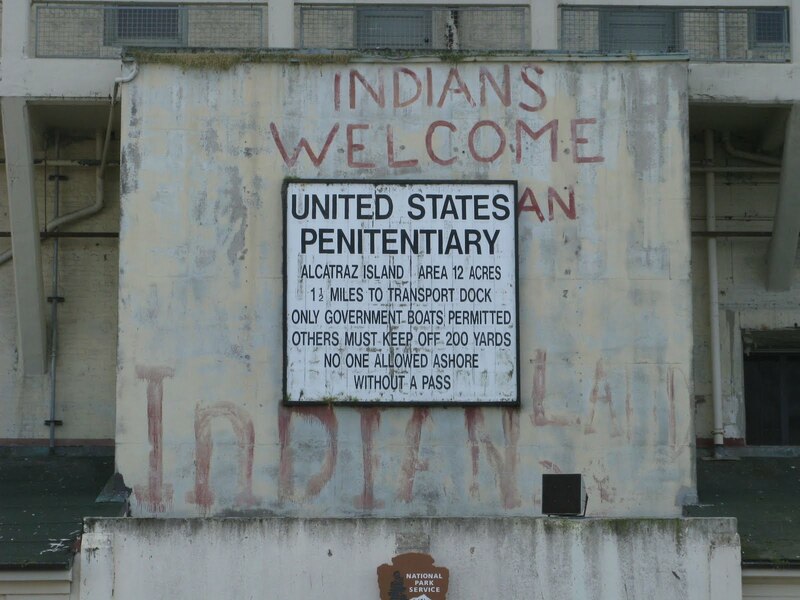 Alcatraz is definitely a ruin that bears the multiple traces of its repeated reinscriptions. Even what might otherwise have been a rather sober audio tour has to take note repeatedly of the way in which the rock and its prison have been figured by Hollywood. Much is made of the escape attempts, which threatened drama but ultimately failed to disturb the penitentiary regime. In the end, it was a combination of banal economics (the place was too expensive to run) and the slow 1960s move towards different philosophies of incarceration that did for the showpiece of America’s disciplinary regime. The prison’s internal architecture does not follow the panopticon model: it has but a single cellblock, with the cells laid out in parallel thoroughfares rather than radiating from a central core. But the rock itself, in full view from the shores of the bay, offers a literally spectacular fable of the price of criminality. Much is made of the fact that prisoners could see the city, and occasionally hear (for instance) the sounds of New Year’s festivities at the Yacht Club. But nothing was said about the effect that having a prison in such plain view must have had on the psychic life of San Francisco itself. 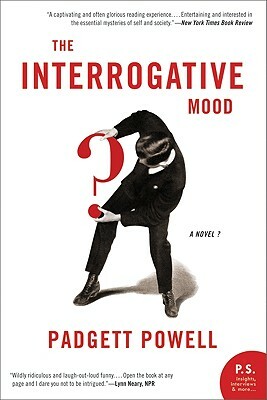 Padgett Powell’s The Interrogative Mood is many things, but probably not a novel. Still, it asks us to consider the question of what makes a novel. Not that this is the only question it asks. For the book is composed solely of questions. Every single sentence it contains ends with a question mark. So, more fundamentally, it asks us to consider what makes a question–and if some questions are more questioning or more questionable than others. Is it time for the director to have a chat with the provost? Do we recall what the dean promised us last spring? Would it be prudent to assume that history will not repeat itself? Whatever else these missives were–gentle cajoling, injunctions that feared to reveal their disciplinary status, the sign of a boss who had drunk the management-speak kool-aid–they were surely not really questions. And so it is with The Interrogative Mood , which interrogates the very act of interrogation, without of course (as in the best interrogations) ever giving up any easy answers. There are sentences that are open-ended investigations of a theme, attempts to resolve some kind of mystery: “Is there charity? Can there be reason?” (112); “Is semaphore still used at sea or has it been displaced by the digital age?” (113); “Could Oswald have done it alone?” (148). But these are very much in the minority. Very many more of the text’s questions are more like the prompts found in an examination or interview: “Do you know what the longest military siege in history was?” (57); “How fast do the fastest birds fly?” (123); “Have you read much philosophy?” (26); “Can you read music?” (66). And of course: “Is there anything you’d like to ask me?” (69), a question that usually expects no reply. But the questions soon take on the tone of an examination gone wild: “Is it correct to say that an orange is eponymous? Why is a banana yellow and not banana?” (67); “Is life better or not better now that for the most part we live it without a daily concern with ramparts?” (70). They frequently indulge in wordplay and logical games: “What color is your crowbar?” (92); “Are you more at ease in a veneer of civilization or a true hardwood of barbary?” (114); “At what point is a gosling a goose?” (133). Sometimes, moreover, the questions seem to reveal more about the questioner than they ask of the person questioned: “Isn’t wool a marvel?” (9); “Are you as fond as I of cobalt glass?” (59). Above all, what the questioning reveals is that a pronounced nostalgia suffuses this interrogative mood. We’re often asked about the past, and about memory: “Do you recall, and did you ever try to use, all-metal roller skates that strapped on over your shoes?” (25); “Doesn’t it seem as if the boardgame called Chinese Checkers was once popular and has now disappeared?” (116). One of the book’s longest sentences concerns the long-vanished roller skates and laments that childhood toys now involve “some Kevlar/Teflon-ey wheels, a microchip gyroscope, a laser level, a GPS, a twenty-four-hour customer-service hotline” and so on (65). No wonder that it goes strangely unquestioned that there must be some “kernel” to “the demise of the world as we knew it” (117). It is as though this book, so full of questions that turn out not to be questions, ultimately despaired of the very grammatical or linguistic shift on which its existence depends. It is as though it rebelled against its very condition of possibility. I sympathize with the disquiet that Padgett evinces with the new voice in which bureaucracy speaks: all apparent concern and solicitousness, questioning and asking us to question ourselves, encouraging self-correction as though denying the very existence of a power that could impose resolution from above. But I’m not sure that there is anything very new here. Language has always been both a means by which power simultaneously operates and disguises its operation. But it has also always provided the possibilities for excess and contradiction that, as this book wryly exemplifies, subvert power’s presumptions and show how precarious is its grip on language. Don’t you think? Although it was inspiring and effective, the metaphor [of empire . . . as a castle besieged by a manifold army of peasants] was a misrepresentation. There was no real siege going on, as you can’t besiege a power that’s everywhere and whose main manifestation is a constant flow of electrons from stock exchange to stock exchange. That misrepresentation would prove fatal in Genoa. This seems right to me. I do still wonder about the effect (if any) of “power’s formal ceremonies,” and so likewise the effect (if any) of disrupting those ceremonies. Is there such a thing as a power that is absolutely non-ceremonial, that doesn’t at all rely on such ceremonies? Or on the other hand, is there a ceremony that is truly empty of power? Meanwhile, I find it rather amusing that Wu Ming took such inspiration from Slap Shot , of all films. Jacques Rancière’s The Ignorant Schoolmaster may be egalitarian, but it is far from anti-authoritarian. Indeed, what’s curious is the way in which the book implicitly argues for the superiority of traditional forms of authority, against the illegitimacy of modern expertise. Rancière’s book elaborates on the theory of intellectual emancipation propounded by the Frenchman Joseph Jacotot in the early nineteenth-century. Exiled from France after the conservative restoration, Jacotot found himself in Belgium where he was charged with teaching French to native Flemish-speakers. Knowing no Flemish himself, Jacotot was forced to rely on his students’ abilities to glean the basics of French grammar from the bilingual edition of a French novel. This they did, with remarkable results. Thus Jacotot propounded a novel pedagogic theory whose basic principle was that “one can teach what one doesn’t know” (15). On this foundation, the observation that teaching is not a matter of communicating expertise from master to pupil, Jacotot develops an entire philosophy, which Rancière in turn seems to affirm. (It is hard to disentangle Rancière’s voice from that of Jacotot.) The practice of explication, instruction, and interpretation is denounced. The true pedagogue enables the student to discover his or her own intelligence, rather than to be illuminated by the professor’s. Or rather, it is suggested that all teaching is a matter of harnessing and guiding the student’s will to learn; “explication is the myth of pedagogy,” whose function is not to communicate knowledge but to produce “a world divided into knowing minds and ignorant ones, ripe minds and immature ones, the capable and the incapable, the intelligent and the stupid” (6). For in fact, all intelligences are equal, or of equal capacity–this at least is the hypothesis or opinion that an emancipatory pedagogy sets out to verify. Hence the radical egalitarianism: all intelligences are of the same kind and “any human work of art is the practice of the same intellectual potential” (36); it is just that sometimes that potential is developed, and sometimes it is constrained. Moreover, one of the foremost forces to constrain the development of natural intelligence is the very educational system that claims that this is its object. The school doesn’t educate; it stultifies. But hence therefore the strange reversion to traditional authority: the business of education has to be taken from the educational system and returned to the family. Intellectual emancipation cannot be systematized; “universal teaching belongs to families, and the best that an enlightened ruler can do for its propagation is to use his authority to protect the free circulation of its service” (103). For it is not that Jacotot (or, implicitly, Rancière) would be done with authority: his students “had learned without a master explicator, but not for all that, without a master” (12). If anything, the new master is more demanding than the old one in forever insisting that the student pay attention and direct his or her will to achieving their own potential: “Is this insignificant? Think about everything the demand implies for the student in the way of an endless task” (31). So it is perhaps unsurprising, if unfortunate, that the family is chosen as the sole legitimate sphere for universal education on the basis that (and here Rancière is directly quoting Jacotot) it “was the sanctuary where the father was the supreme arbiter” (105). The “natural method of the human mind” (105) appeals to the supposed naturalness of patriarchal authority for its implementation. All this is strangely anti-social in every sense of the term, and it’s not clear how much it jives with Rancière’s later concern with precisely the institution of the social (however precarious and necessarily incomplete). But it ain’t necessarily so. For surely this strong division between natural families and un-natural social institutions itself merely replicates the false dichotomy between pedagogy and instruction. After all, explicators and instructors are in fact pedagogues, though they are (ironically) ignorant of the fact: “learning also takes place at the stultifiers’ school; a professor is a thing, less easily handled than a book, undoubtedly, but he can be learned” (102). As such, rather than legitimating the authority of the patriarchal family, surely another route towards emancipatory pedagogy would be the further objectification of the professoriat? Michel-Rolph Trouillot’s Haiti: State Against Nation. 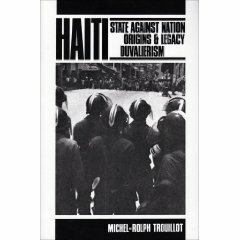 The Origins and Legacy of Duvalierism is a comprehensive account of Haiti from independence in 1804 to the downfall of Jean-Claude (“Baby Doc”) Duvalier in 1986. Precisely the fact that Trouillot feels the need to go back to the early nineteenth century in order to explain Duvalierism demonstrates how deep-rooted he feels the problems that plague the country to be. And though the book concludes with the end of the Duvaliers, it hardly evidences much optimism for what would follow. As Trouillot confesses, “If wishes alone sufficed, I would have ended on a more cheerful note” (228). He is as scathing about intellectuals and others who opposed Duvalierism as he is of the sycophants who enabled it to survive so long: “For if the Duvalierists are understandably among the villains of the story, there is nevertheless no clear champion of the popular cause” (228). One wonders what Trouillot made of the rise of Aristide and Lavalas. Unfortunately, as far as I can see he has published nothing on the topic–and my understanding is that sadly he has been quite seriously ill for some time, so is unlikely to write anything on Haiti again in the near future. He argues here, however, that “any solution to the Haitian crisis must face the peasant question” and “it must find its roots in the resources of that peasantry” (229). Perhaps, for Trouillot, Lavalas may have offered the possibility of some kind of “solution” to the deeply-entrenched crisis that he analyzes as having afflicted the country almost from the moment of its birth. It’s important to note, however, that the role that Trouillot argues for the Haitian peasantry is quite different from that taken by peasants in just about any other Latin American country. Indeed, though it is to be welcomed that Haiti is now (finally) being studied as part of Latin America, and not utterly ignored as has been the predominant tradition, Trouillot’s book does also demonstrate the significant ways in which Haiti’s history and social and political structure have long been very different from the Latin American mainland, or indeed the rest of the Caribbean. Above all, it seems clear that social struggles in Haiti have not primarily revolved around the ownership of land. Whereas in most of Latin America throughout the nineteenth century and up until fairly recently, the prime source of social conflict has been the disparity between large (often absentee) landholders and subsistence farmers, this does not appear to have been the case in Haiti. Here, in Trouillot’s account, the Revolution decisively destroyed the power of the landlords. Against even the desires of the so-called leaders of the Revolution, who “all agreed on the need to maintain largescale export-oriented plantations,” the former slaves utterly refused such an arrangement: “they knew that the plantation system was close to slavery and they rejected it” (49). Hence very early on land was redistributed to the peasants, although this did not of course necessarily mean an end to economic or social inequity: the elites “surrendered land in order to win control of the state” (48). In so far as landlords became rulers, however, they did so as “often nothing but rulers” (76). What resulted, then, was what Trouillot terms a “republic for the merchants” in which the state gained a high degree of autonomy (and hence separation from civil society), its relations with the peasantry mediated through the merchant class, and its exploitation exercised through taxes, particularly export taxes levied at the custom houses. “It is thus fair to say,” Trouillot concludes, “that the landlords have remained, since the 1840s, in the shadow of the alliance of rulers and merchants, never again becoming an autonomous social force” (78). In a subsequent post I will look at the conclusions that Trouillot draws from this anomalous social structure, which enables the face-off between state and nation that he sees coming to a head under the Duvaliers. I will also examine how this relates to the concept of hegemony that Trouillot employs, and particularly to Laclau (who provides the book with one of its blurbs, but I will argue singularly inappropriately). When Latin American modernization projects fail, or when their ideological legitimation falters, authoritarian regimes often step in to complete (or to further) their agenda. Though authoritarianism is defined by its contempt for consensus (for which it substitutes coercion), it does not give up on discursive legitimation altogether; it merely prioritizes efficiency over hegemony. Authoritarianism’s legitimation may still take its cue from populism’s project of national popular redemption. 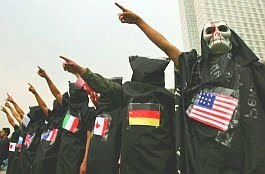 Authoritarianism comes to be the pursuit of hegemony by other means once populism has defined hegemony as the model for the political–or rather, once populism has defined hegemony as politics by other means. Military rulers seeking justification by appealing to populist understandings of hegemony give an ironic twist to the martial understanding of politics implicit in the Gramscian concept of hegemony. Authoritarianism literalizes what, in cultural studies at least, is the figurative conceit of defining the pursuit of hegemony as a war of position. Thus the Argentine military president Juan Carlos Onganía in 1966 appeals to national unity, arguing that “the cohesion of our institutions [. . .] ought to be our permanent concern because that cohesion is the maximum guarantor of the spirit that gave rise to the republic” (qtd. in Loveman and Davis, The Politics of Antipolitics 195). Equally, handing over to what would become Perón’s second administration, “in his farewell address to the Argentine people in 1973, General Alejandro Lanusse felt obliged to thank his fellow citizens for their patience with a government that had not been elected” (Schoultz, The Populist Challenge 20). In the first and last instance, I the Supreme is a novel about power. As we have seen, the title itself is a declaration of power and authority: power is here made to speak, performatively. The first person declares himself to be first among the equals that constitute the republic in a relation of apposition that is to go without saying, for “I, the Supreme” presupposes the initial foundation “I am the Supreme.” This foundation is to be taken for granted; the Supreme insists that he (and only he) has the right to speak as supreme authority. He is the state. But as we have seen, the novel also revolves around the fact that the parody found pinned to the cathedral door threatens to undermine this assumption of supreme power. It would seem that somebody is attempting to usurp the Supreme’s right to absolute authority by forging his authorship of state decrees. Hence the book threatens to undo the assumption contained within its title, and the Supreme finds himself forced to justify and so (re)legitimate his place as head of state. The novel unfolds as an anatomy not only of power but also of (potential) counter-powers. The dictator reasserts his right to supreme authority not only through repression but also by narratively re-enacting the history of the state’s coming into being, its struggle for independence first from Spanish rule and second from the threat posed by the neighboring states of Argentina and Brazil. Thus the Supreme re-tells the story not only of the battles but also (more importantly from his standpoint) of the negotiations in which he played a key part in maintaining Paraguay’s autonomy as the various parts of what was previously the Spanish Empire reconstituted themselves as sovereign nations. The establishment of Paraguayan sovereignty is represented as a process that is both material and discursive, a question of force and persuasion. Even the most absolute of dictatorial powers feels the need for discursive legitimation. We should note particularly that the discourse to which the dictator has recourse establishes Paraguay as a distinctively modern state, and thus the Supreme’s power as a specifically modern power, in so far as his narrative is one that invokes the people as the source of legitimate power. Rather than the divine right that was invoked to justify monarchical power, the Supreme appeals to the notion of a social contract as elaborated by the French philosopher Jean-Jacques Rousseau. Indeed, he signals that he is more modern than the Argentina delegation who come to Asunción with their talk of power politics and pragmatics. He is frustrated that there is not more opportunity to talk further about the principles of political philosophy and their adaptability to the nascent American republics: “I would have liked to discuss at that moment the principles of the Social Contract as applied to our countries” (205). Paraguay was, after all, the first Latin American republic, and the Supreme’s concern is in part how to found this new type of regime from the ashes of a discredited Empire. Rousseau’s notion of the Social Contract is an attempt to legitimate the State through reason and consent, rather than tradition (or theology). A newly independent Paraguay has no republican tradition on which it can draw (and has turned its back on the church). All that remains is reason, and it is important to recognize therefore that the Supreme is a profoundly rational man in so far as his power is founded upon reason’s dictates. This is so even as and when we see his reason dissolving or becoming unreasonable. We should still see that his attempts to consolidate his power have also to be presented at attempts to ward off the irrational. And after all, in so far as his power is undercut, it is never by reasoned argument, but rather by parody, multiplicity, or material decay (of either his body or his text). What we have, therefore, is a hyper-politicized version of Borges’s concern with the limits of reason. In the person of the Supreme, the Borgesian preoccupation with reason and order is immediately also a concern with the legitimation of the social. The crisis that afflicts the dictator (and if this is a novel about power, it is also a novel about power in crisis) concerns the extent to which not only his will but also rationality itself can be imposed upon a recalcitrant world. There is an echo of Hamlet , here quoted in the dictator’s conversation with the Robertsons–“There’s a Divinity that shapes our ends, / Rough-hew them how we will!” (129). The Supreme’s wager is that he can invoke a republican power that supersedes the things of heaven and earth: “I am the final judge. I can decide how things will go. Contrive the facts. Invent the events” (196). In a sense, then, dictatorship is presented not so much as the power of the individual counterposed against that of the people, for the people, the State, and the individual are a single entity incarnated in the body of the people’s supreme representative; rather dictatorship here involves the attempt to assert the power of reason over that of history.